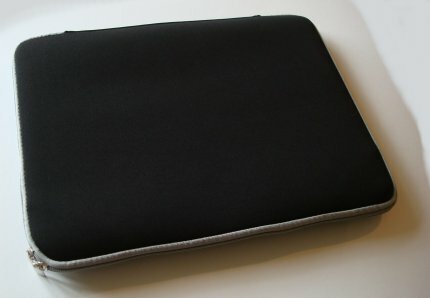 After buying a 2010 13 inch MacBook Pro, I wanted a protective sleeve to go with it. I bought this one from Amazon. It is a fairly basic one, cheaper than other versions. 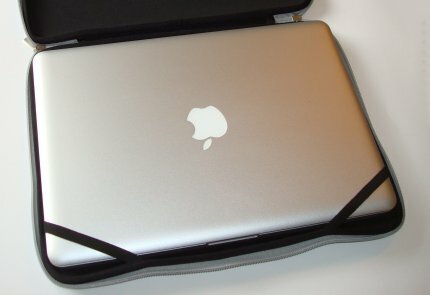 This is what it looks like with the MacBook inside. If you read the reviews on Amazon you’ll see that someone has commented on the plastic smell. It does certainly smell, but not so bad that I had to leave it in a garage for a whole day as the Amazon reviewer did! Here’s what it looks like open with the MacBook inside. You can see there are little straps that go over the corners of the MacBook. You might be able to see that the sleeve is fairly loose – it is not what I’d describe as a tight fit. The gap is probably about 1cm at the top. This is what it looks like open and empty. My verdict is that this is a perfectly adequate sleeve for the 13 inch MacBook Pro. It isn’t perfect – the size is slightly too big. 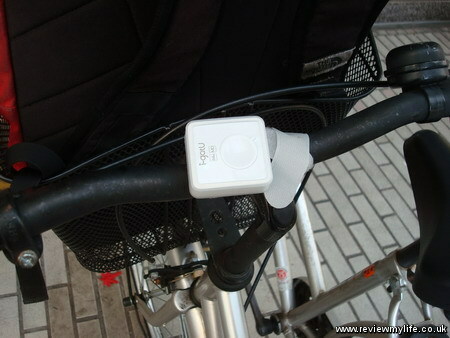 But it is a lot cheaper than many other versions which might be a more perfect fit. 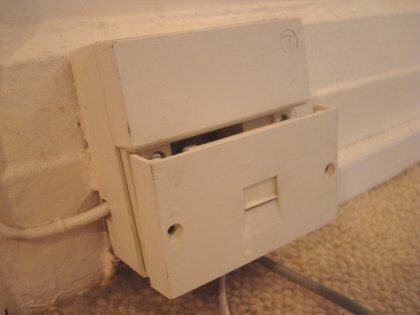 I’m going to talk about how to fit an NTE5 compatible ADSL filtered faceplate to your BT master socket. 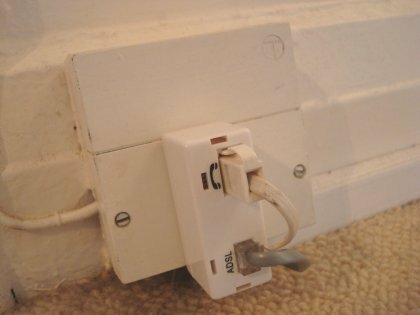 This will allow you to plug your broadband modem router directly into the BT master line box, rather than having to use an ADSL micro filter. I’ve previously written about some of my broadband problem in my post about understanding signal to noise ratios, and my post about finding the best WiFi channel with Vistumbler. These didn’t solve my problems so I decided to buy an ADSL faceplate which fits directly onto the BT master socket. 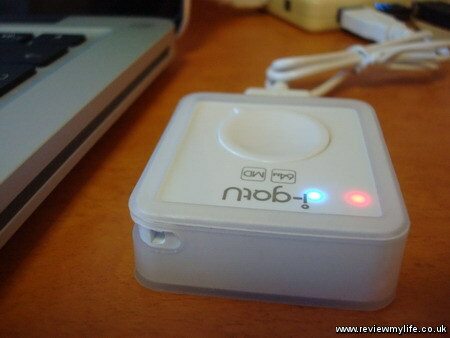 By removing the need for a separate ADSL micro filter the theory is that the broadband signal quality will be improved. 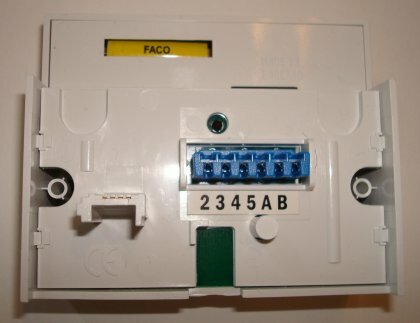 The NTE5 compatible ADSL faceplate. An instruction leaflet from BT explaining how to fit the faceplate, and how to re-wire any telephone extension cabling you have. A piece of paper with some supplementary information. Here is a close up of the rear of the ADSL faceplate. 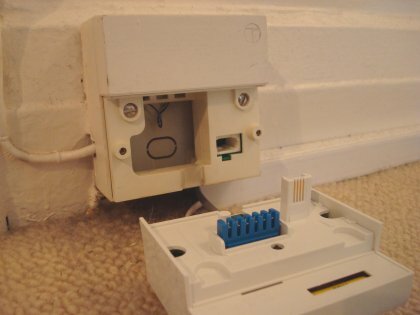 You can see the plug that will go into the BT test socket on the left, and the connector for any extension cabling is the blue section in the middle. The first thing I had to do was to get the bottom plate off the BT line box. As a previous resident had painted the line box I had to use a Stanley knife to cut the paint. I then used a small screw driver to remove the two screws. This photo shows the bottom plate partially removed from the line box. I don’t have any extension telephone wiring, but if you do it will be attached to this bottom plate, so you’ll have to take care when pulling the bottom plate out. Plugging in the NTE5 ADSL faceplate filter is very simple. You can see how the plug on the new faceplate lines up with the test socket in the BT line box. 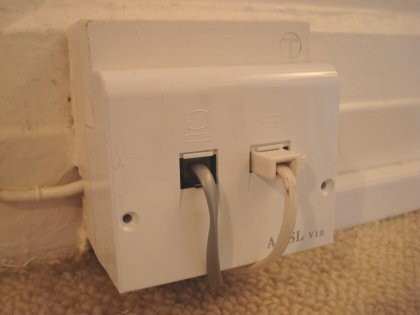 After it is plugged in, your master socket will look like this with a connection for your phone, and a separate connection for the ADSL cable. 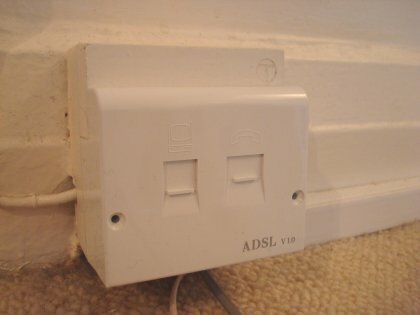 This ADSL faceplate is designed to be the correct size so it blends in with the BT line box. There is a minor problem with the supplied screws. They need to be longer than the original ones as the new faceplate adds width to the BT line box. But the new screws have a thread size that is completely different to the original screws. You can screw them in, but that will damage the original thread of the line box meaning you won’t be able to properly put the original screws back in if you wanted to go back to using the original faceplate. For this reason I’ve not screwed the new faceplate in yet. I’ve been using this ADSL faceplate filter for over a week now. I was impressed with the speed of delivery after ordering from Amazon. It was very easy to install, but I think they should supply screws that match the thread size from the original BT line box. Before installing the faceplate my signal to noise ratio was an average of 8.6dB / 27dB (downstream / upstream). After installing the faceplate the signal to noise ratio was still an average of 8.6dB / 27dB. So it made no difference to the signal to noise ratio. I therefore think that my low downstream signal to noise ratio is not related to my original faceplate or my original ADSL filter. However I do believe that it has reduced the frequency of dropped internet connections. I can’t give any definite measurements to support this, but I do feel like I’m resetting my modem router less often now. In terms of appearance it does look better with the new ADSL faceplate as opposed to having my original BT faceplate with the ADSL microfilter sticking out of it. Do I recommend it? Yes – but it isn’t essential. I don’t think it will perform miracles, but it may improve the quality of your connection, and it will make your BT line box look more modern, tidy, and up to date. 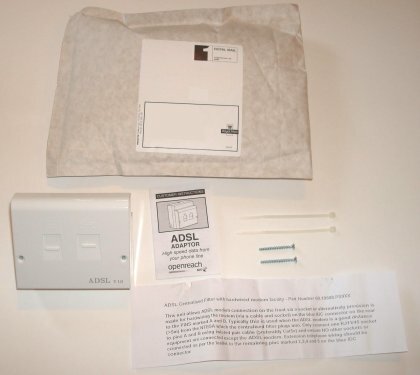 You can buy this ADSL faceplate direct from Amazon. I bought the Samsung N140 netbook from Amazon very soon after it was released and have been working with it regularly for a few months now. 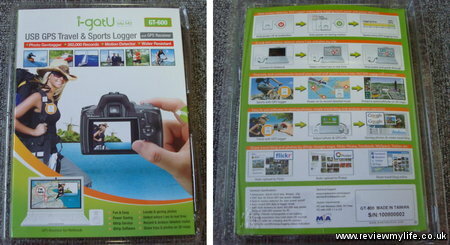 I’m going to review it based my real world experiences of using it. 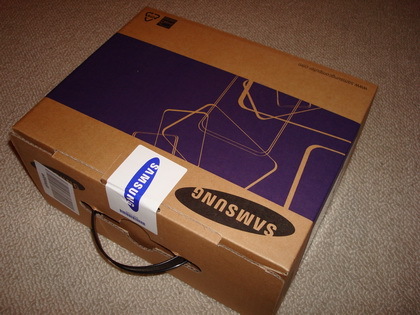 The Samsung N140 comes in a fairly compact box. If you are used to buying standard sized laptops then you’ll notice the difference in size and weight of the box straight away. Inside the box is the N140 itself. At the time I bought mine there was a black version and a white version. I went for the black one. The exterior is made of shiny black plastic that soon accumulates smudge marks. When closed you can see the silver trim that goes round the N140. The silver trim is one of the few physical differences between the N140 and the N110. I got the Windows XP version. 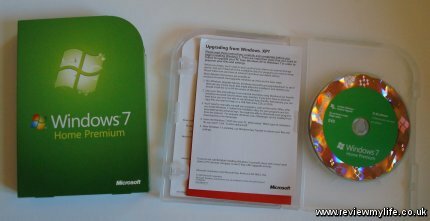 If you buy it now then you’ll probably have to buy it with Windows 7. The N140 specs are fairly standard for a netbook. 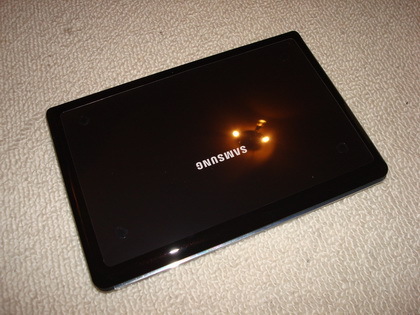 It has 1gb of RAM, 160gb hard drive, a 10-inch screen, and an Intel Atom N270 CPU. 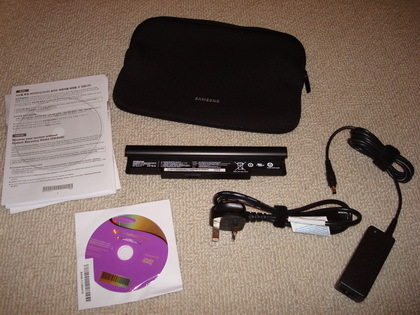 The big plus over many similar netbooks is its claimed 9-hour battery life for WinXP (7.5 hours for Windows 7). 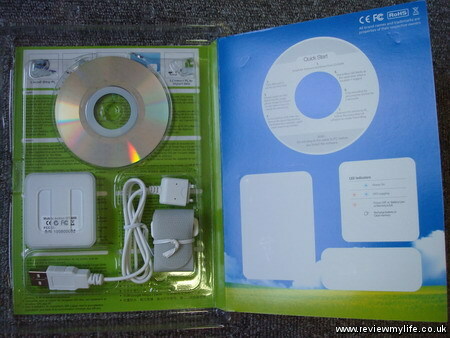 Also in the box are the battery, mains adaptor, a DVD, some basic manuals, and a soft zip-up case. To get up and running you’ll need to plug the battery in, plug the mains charger in, and then turn it on using the slide switch on the front. 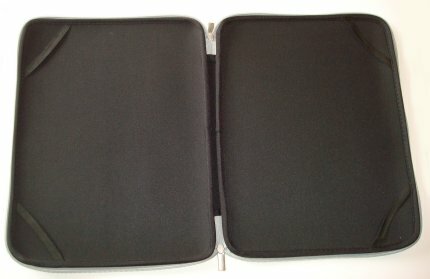 The battery does bulge out of the bottom of the case but I have actually found the shape makes the netbook easier to hold when carrying it around, especially when it is in its case. Setting up the Samsung N140 takes about an hour, as the initialisation process requires multiple reboots. You’ll have to decide how you want to split the 160gb hard disk space between the c: and d: drives (which requires a reboot). I went for a 51gb c: drive and a 91gb d: drive. 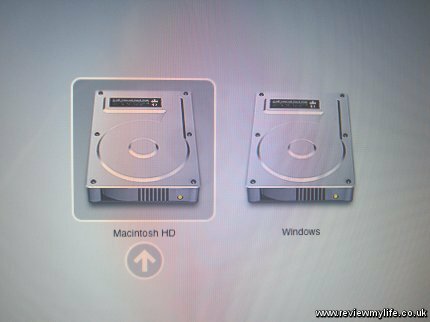 It needs another reboot to create a backup image of the initial OS contents onto the hard drive in case a full restore is needed. And I seem to recall that there were a few more reboots that were needed before the N140 was finally ready to use. When it was finally ready to go I spent another hour or so installing my usual anti-virus and security software (Avast, Spyware Blaster, Rapport). I’m used to touch typing on a full sized keyboard and have had no problems touch typing on the N140 keyboard that is 90% of the size of a full keyboard. It is a much larger and more comfortable keyboard than others found in similar sized netbooks. The right hand shift key is in the wrong place. It is too far to the right of the keyboard so I find I keep on pressing the ‘\’ instead of shift. The Home and End keys aren’t dedicated keys. You need to press the function key to use them. I use the Home and End keys all the time so I do find this a bit annoying. 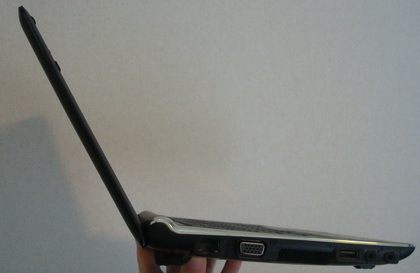 The screen resolution is 1024×600, the standard for a netbook. The image is sharp and the screen brightness is reasonable – the image doesn’t go as bright as my Sony Vaio but it is good enough for general use and usable outdoors. One advantage the N140 has over the N110 is that the screen is matte rather than glossy. This vastly reduces the reflections you get in the screen and makes it easier to use the N140 outside. If you are used to a desktop monitor then you may find the 600-pixel height to be a bit cramped. You may find it useful to turn off the Windows taskbar or learn how to make your applications go full screen. For example Internet Explorer and Firefox can be made full screen by pressing F11 – which makes browsing the web much more pleasant. The one problem with the screen is that its angle of backward tilt is limited. The angle is fine if you are using the N140 at a desk. 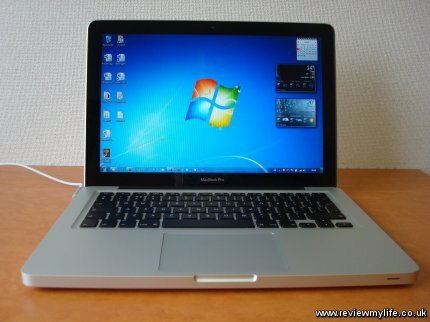 However if you are sitting in a chair with the N140 on your lap – as you might well do with a lightweight netbook – then you might find that the screen doesn’t go as far back as you’d like. The area where the N140 stands out is its battery life. It has a claimed battery life of 9 hours and I find that when I use it for real (using several applications, WiFi, and with the screen brightness turned up) it certainly lasts at least 6 to 7 hours. If you were to reduce the screen brightness and turn on the power saving mode then I’m sure you’ll get more usage time out of the battery. The battery is great as you can go out for a day with the N140 without needing the power supply. You can work on it for several hours, and whereas a standard laptop would be running out of juice, the N140 reports that its battery still has plenty left in it. 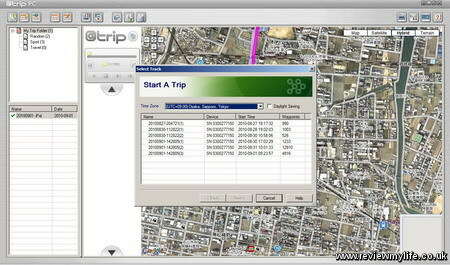 The weight is reported as being 1.33kg with the battery. Its size is standard for a netbook. I can easily slip it into my rucksack and still have plenty of room left for whatever else I want to carry. The weight is low enough so you can carry it around all day. I’ve even gone hill walking with it on my back! The N140 has a built in webcam, microphone, and speakers, which makes this a great device to use with Skype. A headphone and a microphone socket are on the side should you need them. 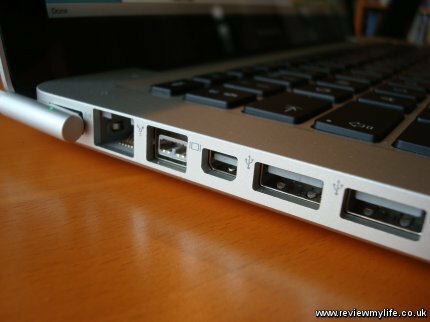 There are three USB ports, two on the right side and one on the left. Also on the left side is a VGA output and network port. 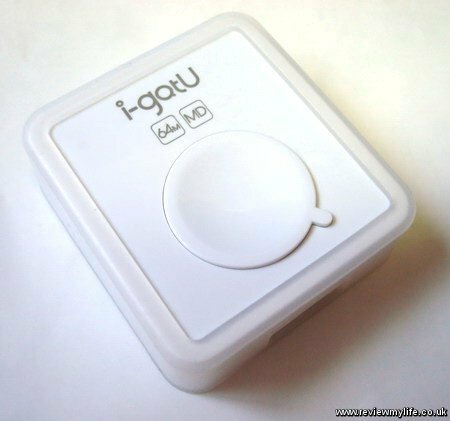 WiFi and bluetooth are built into the model that I have and I’ve found the WiFi to be very reliable. The button to disable the WiFi and Bluetooth (for airplane usage) is a soft key rather than being a dedicated switch so you’d need to turn the N140 on in order to disable them. At the front is an SD card slot and finally on the right is a Kensington security slot. 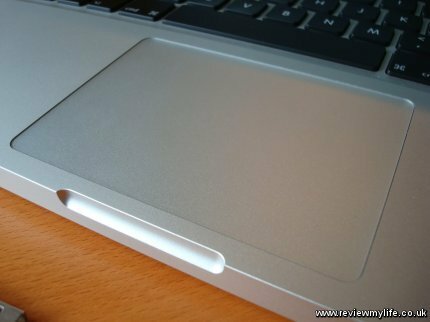 The trackpad is a reasonable size for a netbook like this and is perfectly usable. 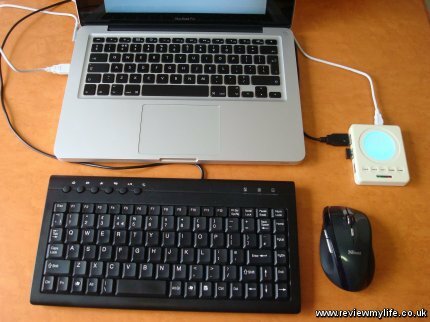 I tend to use a wireless mouse myself as I’m not a fan of trackpads – I’ve bought a Trust wireless mini mouse with a micro sized receiver which takes up one of the USB ports. The receiver is small enough that I can put the N140 into its case without having to remove the receiver. The power supply is compact and works on multiple voltages. I’ve had no problems using it on both 240v UK power supplies and 100v power supplies abroad. After having used the Samsung N140 regularly for two months here are my findings on how it copes with the kind of computing tasks I do. Please note that I’m basing my findings on an N140 that has been upgraded to 2gb of RAM rather than the 1gb that mine shipped with. In the background I have Avast anti-virus and Spybot Search and Destroy running all the time. Word processing – I’m regularly editing documents using Word 97 with no problems. Currently I’m writing this blog entry and have Firefox and ACDSee running in the background as well. OpenOffice runs fine as well but is slower than Word. Internet – No problems with multi-tabbed browsing in Firefox, Internet Explorer or Chrome. When I’m browsing I’ll often have the Thunderbird email client, a word processor such as Word 97, and the FileZilla FTP client in the background at the same time. Photo editing – ACDSee and PaintShop Pro 5 can happily be running at the same time when I’m editing my photos. iTunes – Syncing with my iPod Touch and downloading new songs or applications from the iTunes store is fast enough, even if I have other apps in the background. 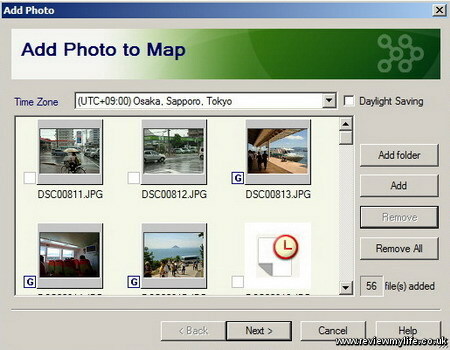 Syncing photos from my camera – Syncing photos from my camera is speedy. Videos – Ripping a DVD (using an external DVD drive) at 50% compression takes about 90-120 minutes for a 90 minute film. The VideoLAN player is capable of playing the resulting film on the N140. I’d suggest you: 1) Enable the ‘Increase the priority of the process’ option by going to Tools->Preferences, clicking ‘All’ in the ‘Show settings’ option, and then going to ‘Advanced’. 2) Put the N140 on fast mode. 3) Video is one area where the N140 can’t cope well if multi-tasking with other applications. If you are doing video ripping, or playing then I’d recommend you close down your other applications. In conclusion the Samsung N140 is a great machine for computing when away from home or if you are happy to have a smaller screen. The battery life is amongst the best available right now. The combination of screen, keyboard, and good CPU power (for a netbook) make this a very useful device. I’d recommend upgrading the RAM to 2gb if you intend to run multiple programs at the same time. I’ve had mine for two months now and when away from home have no regrets about leaving my main laptop behind. 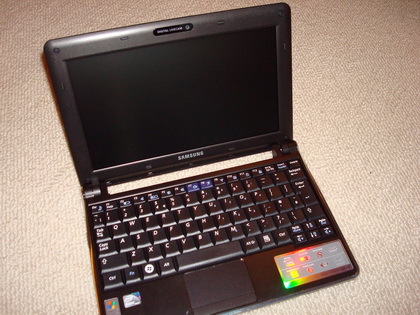 You can buy the Samsung N140 netbook from Amazon. 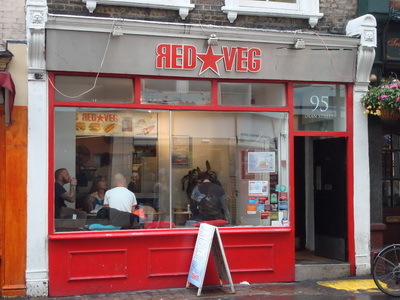 Here is a list of my favourite places in London to get Vegetarian food. The first group are actual vegetarian restaurants. The second group are restaurants that just happen to have good vegetarian options. They are presented in no particular order. 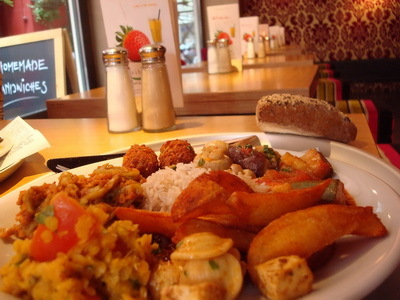 Tibits is a vegetarian buffet restaurant that started in Switzerland and has now come over to London. They have both hot and cold food. The food is of very high quality. They have pastas, lasagnes, vegetables and salads. When you go in you get a plate and fill it up with whatever you want. At the till they weigh the plate and you simply pay for the mass of food that you have bought. You get a bread roll with your food as well. Sagar is a restaurant serving vegetarian Indian food. There is one in Hammersmith and this one in central London. You can get food such as dosa and thalis. There is a range of deserts and drinks such as lassi. The interior is clean and the food is tasty. A lot of vegetarian restaurants can have a bit of a ‘hippy’ atmosphere with pan pipe music and many plants inside. It is nice to have something different in the form of Red Veg. It is a fast food outlet which serves burgers, hot dogs, wraps and chips. It is very tiny – there are a few seats but not enough to guarantee you a seat. This is more a place to buy fast food to take out. Update: Since I originally wrote this Red Veg has closed. But check out their website for the location of their Brighton location. 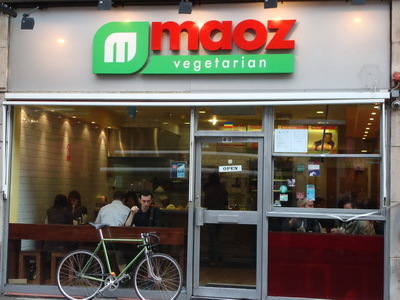 Maoz is a falafel restaurant. They’ll make your falafel to order and they have a wide range of salad to eat. They have side orders such as chips. You can either eat in or take out. A good option if you want some quick vegetarian food. 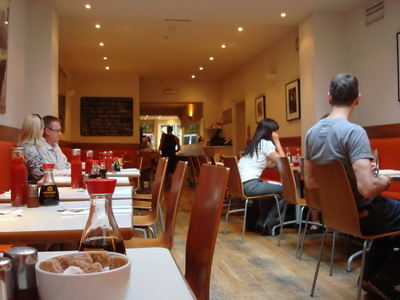 Mildreds is a great vegetarian restaurant in Soho. You can get pasta, tofu, burgers and a tofu stir fry. On the day I went I had a mushroom and ale pie! They have a selection of deserts including a tofu cheese cake. Mildreds also run a cake shop on the same road at number 53 called Mrs Marengo’s. 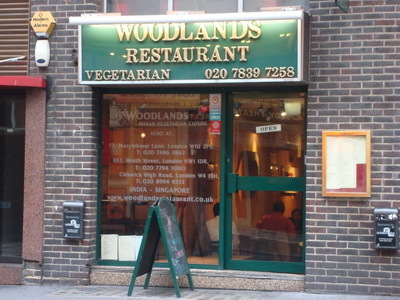 Woodlands is a smart looking vegetarian restaurant near to Leicester Square. They have the usual vegetarian options of dosa, thali, and rice dishes. The restaurants above are all in the West end of London. Sakonis is a lot further out in Harrow, but if you want very cheap authentic vegetarian Indian food then it is worth a visit. At lunch times they do a great buffet with dosas, chill paneer, bhel poori, and a variety of curries. You can eat as much as you like. Plain and strawberry ice cream is included in the price. Pizza Express is a big chain and is a safe bet if you want a tasy pizza or pasta. There is a good selection of meat free dishes here. The funghi, margarita and giardiniera pizzas are of course vegi, but if you want something different you can ask them to put whatever vegetable toppings you like onto your pizza. Just don’t let them put parmesan cheese on your pizza as this is made with animal rennet. 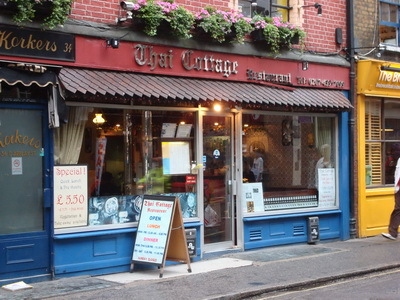 Thai Cottage is a small Thai restaurant in Soho with a family feel. They have many tasty and sometimes quite spicy Thai dishes. I particuarly like their stir fried tofu. A vegetarian green curry is also available. Nandos is a chain and their restaurants are all over London. They are known as being a chicken restaurant but don’t let this put you off. They have a number of very tasty vegetarian options (which can be as spicy or not depending on which marinade you order). When you arrive you are allocated a table number, you then order from the till and sit down. Your food will be brought to you. Good vegi options include the veggie, bean or portobello bugers and the pittas which are especially tasty with the spicy marinade. On the side you can order peri peri chips, salad, rice and corn on the cob. There are many Thai Square restaurants around London but the best one is in Trafalgar Square. If you are looking for a ‘posh’ looking restaurant with good vegetarian options you may find it difficult. There are countless expensive restaurants in London but most of the pricier ones have really bad vegetarian options. Often they have a token option such as spaghetti pomodoro – hardly very imaginative. The Thai Square in Trafalgar Square fills a niche here. The decor inside is nice enough to take a vegetarian on a special occasion, and there are many good vegetarian options. This is a map of all the central London restaurants (only Sakonis which is in Harrow is excluded!). Fully vegetarian restaurants are shown in green and other restaurants with good vegetarian options are shown in yellow. If you are going to a Thai or Chineese restaurant watch out for restaurants putting fish or oyster sauce on your food. Ask for no oyster sauce but you can tell them that soy sauce is fine. Realistically if you go to a restaurant that also serves meat there is a good chance that there may be a small amount of contamination from shared food utensils or shared grills. The situation here in London is much better than in other European cities. If the idea of any potential mixing of utensils is too much for you then you are better off sticking with pure vegetarian restaurants.